CBS 2’s Megan Glaros introduces The Church Of Tisch’s latest ride. – How to get ahead by channeling the Xbox One and the PS4: CBS-owned WBBM-TV has unveiled its latest weapon in the weather war, with the look and feel of a video game – one you can play on the road. 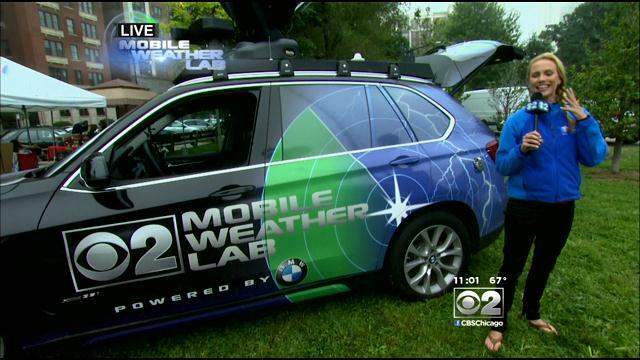 WBBM’s new toy is a new vehicle called The Mobile Weather Lab, and the Columbia Puslar 600 ultrasonic weather station on wheels can pinpoint inclement weather at precise locations and determine the location’s humidity, temperature, barometric pressure, and so on. The ride also features 4G cellular technology. The vehicle also comes equipped with several cameras, including an HD camera that rotates 360 degrees showing conditions while the vehicle is in motion, using a wireless joystick inside the car. Behind the rear seats is a control panel used to monitor the cameras. But knowing CBS 2, the Mobile Weather Lab could go haywire and the vehicle could hunt down and try to run over Tom Skilling. – A radio personality jumping immediately from one rival station to another doesn’t happen every day – or every month for that matter: Angie Martinez, who had a show on New York’s WQHT-FM (Hot 97) for the last two decades or so, resigned Wednesday from the station – only to turn up the next day at rival urban station WWPR-FM (105.1 FM), owned by Clear Channel. Outside of the Big Apple, Martinez is better known for had a hit single in 2003, If I Could Go, becoming the first radio sitting personality to hit the charts since Rick Dees went to the top with Disco Duck in 1976. She also is a correspondent for Extra. – On the other side of the country is a major scandal brewing involving the PPM in Los Angeles. It turns out two Spanish-speaking households in the era influenced the ratings so much, it lead to wild rating swings for one Univision (KSCA-FM) and one Groupo station (KXOS-FM), with both stations surging in April but came crashing down to Earth in May. Nielsen had to delay the release of May numbers due to the problem. Nielsen purchased Arbitron several months ago, with some questioning the wisdom of having both the monopolistic TV and radio measurement services under the same roof. In one household, a family was related to a Univision Radio executive, which disqualified them (Univision fired the employee in question.) In the other, a family broken Nielsen rules regarding PPM devices. Nielsen has pledged to add safeguards to prevent the problem from happening again. But the real question is, how many more markets are tainted? If it could happen in the nation’s second-largest radio market, it certainly can happen anywhere. – Get ready for more diginet fun: at least two more diginet movie channels are on the way, with Katz Communications (no relation to Katz Media) launching Escape and Grit. Escape targets older female viewers with female-friendly movies and TV series, while Grit targets male audiences with macho movies featuring John Wayne, Charles Bronson, and others. Both channels have cleared Univison-owned stations in top markets (including WGBO/WXFT in Chicago and cleared the Raycom station group this week, including WOIO/WUAB in Cleveland and WSFA in Montgomery, Ala.